skiers June 10th, 2001: It's a busy weekend at the Park; even though school's not out yet, the weather has been about as good as it gets. Water skiers started about nine this morning; by eleven, there were quite a few people on the beach. smorgs At the Beach Café, Lilianne handed Rose Steadman a poster listing smorgs for the summer, and there were a lot ˜ breakfast, luncheon and dinner, from now through August. I phoned the Cove, and they, are having regular Sunday dinner smorgs, right through the summer. You heavy eaters will be in hog heaven! caterpillars Here it is the tenth of June, and no caterpillars! The Park was sprayed about May 24th, and it must have been successful. Last year, when we still lived up on the hill, they were getting closer and closer; an airplane sprayed an area between us and the Park, but I never did hear how successful it was. We expected a full-blown outbreak of worms this year, but (I say with fingers crossed) it doesn't look as though it is going to happen. Frank Duhaime says the spray targets only the troublesome caterpillars, and doesn't affect other insects or birds. trees No caterpillars here, but other places aren't so lucky. Lots of stripped trees out on Elkridge Road, and lots of squished caterpillars on the road. From the hill south of the park looking west, the toboggan hill looks completely stripped. We were over at Marean Lake a couple of times this week, and didn't see any sign of caterpillar damage over there. Friends & Neighbors Greenhouse We were over there picking up some last-minute plants from Friends & Neighbors Greenhouse; Jan tells us she had a busy season, but still has a lot of good-looking plants left. Rumors that she is sold out are greatly exaggerated! cabin The Laxdal cabin is the first one along Lake Ave. east of the Park's non-modern cabins. 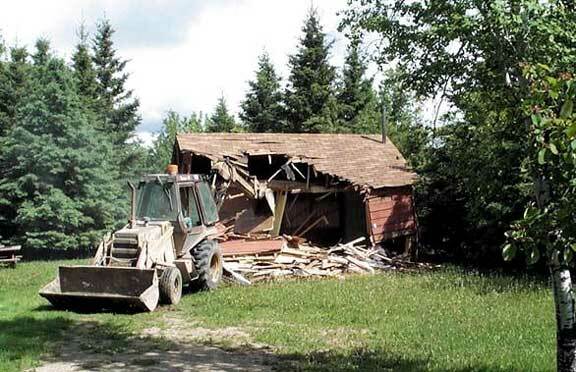 It is quite old, and apparently the floor was dangerous, so on Thursday Brian Lund came out with his backhoe and knocked it down. I went down with my camera and got a few shots I doubt if it was more than ten minutes from start to finish, and it was a pile of trash. 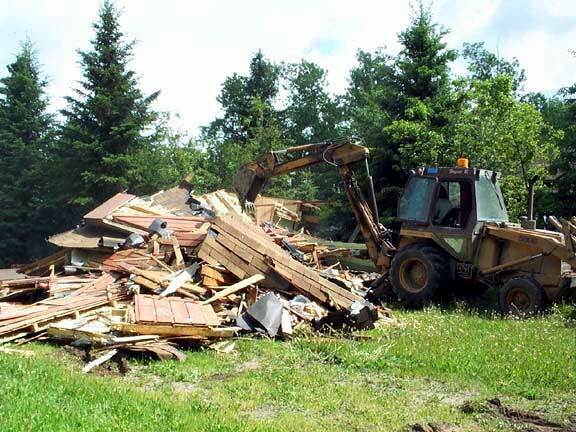 Of course, next he had to clean it up and haul it away; four hours and six loads later, he was still at it. rain Finally, some rain! We got a little Tuesday night and Wednesday, but it rained fairly steadily Wednesday night; by Thursday morning we had just slightly more than one inch in our gauge. Beautiful! rate Headlines: "Public utility rate hike slashed by Premier!" Sound familiar? It's the old Canada Post game let word get out that postage rates will rise by a dime a letter, let the flack die down a bit, then announce that the increase will be only half, and everyone heaves a sigh of relief. Do they really think we are that gullible? Are they right? water Living at the Park, we have to get used to having a big tank of water in the basement, keeping track of the septic tank, etc. We did pretty well up until today. I decided to top up the water tank since I had the hose rolled out, then didn't watch it closely enough. Later, I heard the sump pump run, then run again almost immediately, and sure enough, there was a stream of water from the tank to the sump. No harm done, though the floor is graded well enough that the stream made a beeline for the sump and didn't flood any other areas. barges Something Saskatchewanians are not too familiar with is the system of locks and dams that allow boats and barges to navigate rivers. On our recent trip into the US, we travelled along the Mississippi River for many miles. At one point, we turned off at a sign that read: "Lock & Dam No. 9". There was a lookout platform on our side, so we climbed it and watched a barge train navigating the lock. 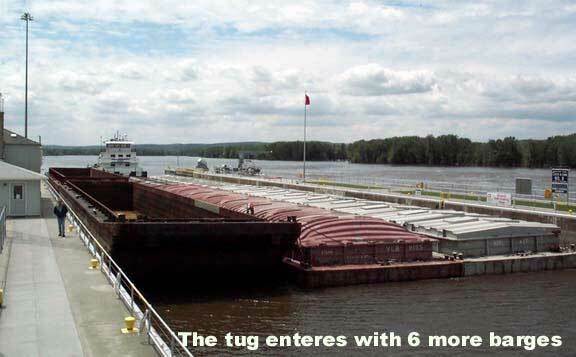 When we arrived, there was a block of nine barges in the lock, about 600 feet long and 90 feet wide. A man riding on the barges told us there was a winch engine, or mule, as he called it, pulling the barges through. system The tug boat, with six more barges, was still downstream, waiting its turn. 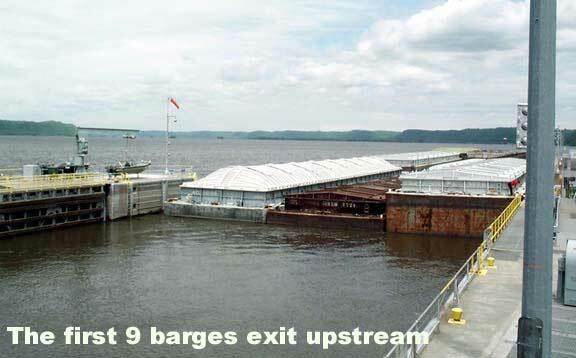 When the lock filled, the upstream gates opened and the nine barges were pulled out into the river. Those gates closed, and the downstream ones opened, lowering the water level in the lock and allowing the tug with its six barges to enter. Then the downstream gates close, the upstream ones open, flooding the lock to the level of the river upstream, and the tug joins the rest of the train. Since the rivers were all running high, there was only about a two-foot difference in water level, but the lock is capable of eight to nine feet. I knew there was river freighting right up to the Twin Cities; why was I surprised that there was a lock system?